Is a Clean House with Kids Really Possible? You are here: Home / Family / Home Life / Is a Clean House with Kids Possible? Is a Clean House with Kids Possible? My friend Rebekah H. was nice enough to stop by today and share her tips on how to get your kids involved in helping to keep your home clean. I rent a house, and when me and my four rowdy kids moved into our new place, I could just see the property manager wince. I can’t blame him. After all, cleaning up after messy tenants can be a tough job. However, I’ve been gouged on security deposits before, and in this place, I resolved that I would make a habit of keeping tidy. Easier said than done, right? If there’s one challenge every mother knows, it’s the challenge of keeping the living room clean for more than five minutes at a time. The minute the kids enter, there’s an explosion of toys, snacks, clothes, school supplies, crayons. Seriously, most of the time I don’t even know where the kids are getting this crap. It just appears! But having a clean house is wonderful enough to fight for. It decreases stress, fosters good habits and expectations in your kids, and significantly decreases the odds of you gouging your heel on a stray Barbie. Additionally, it can protect your family against creepy spider infestations, keep your possessions in better shape, and make room in your life for worthwhile projects and family activities. However many times you ask your kids to clean, it never gets done. To them the floor is simply the biggest shelf in the house. Well, welcome to the greatest motivator: the gunny sack. Take a large canvas drawstring bag and draw on a face. The gunny sack lives in the closet, and when he gets hungry, he comes out and eats all of the toys. Either your kids can clean up, or they can lose their toys. It’s easy to clean up the room quickly when all you have to do is scoop everything into a sack. Now here’s the true beauty of the gunny sack: once toys have been swallowed, only you can retrieve them, and it’s the perfect leverage for your kids. You can treat your child to choosing one toy out of the gunny sack when they do something good. Or if they keep the room clean for a certain amount of time, you can surrender everything in the gunny sack. One more thing: If you’re trying to cut back on the amount of toys that your kids have, the gunny sack transitions easily into a minimalist tool. Anything that’s been in the gunny sack for 6 months or so could be disposed of. Don’t let kids see what’s inside. Instead, they have to specially ask for the toy in mind. Most of them will be forgotten, and you can provide ways for kids to get back their very favorite toys. Now I know what you’re thinking… what’s to stop kids from just retrieving the toys themselves? Well, in my experience, that face works wonders. Kids are actually kinda scared of the gunny sack. It will take a while before they’re old enough to know that they can just reach into his mouth and get their toys back. When my boy David was two years old, he loved helping me clean. Did he do a great job? No, not at all! But he loved it. Gradually, he learned to be more organized and coordinated, and he was able to help more and more. Kids love feeling useful, and they love doing what you do. So, instead of getting frustrated with your child when they try to help, encourage them as much as you can. Teach as you go and they’ll get better and better at it. One of the best ways I know how to do this is by going in phases. Start with really simple tasks, like putting their toys back into a basket. Progress to teaching them how to put away clean clothes into their drawers. Then teach them how to pick up small items off the floor so that you can vacuum. Once they’re about 8, you’ll have a kid that knows how to vacuum, do dishes, and even do their own laundry, if you just teach them piece by piece. This technique revolutionized my kids’ rooms. The way I see it, most of our clothes-mess comes from one basic oversight, and it’s this: clean clothes go in the closet/drawer. Dirty clothes go in the hamper. Okay, but what about those clothes that you already wore once, but they don’t necessarily need to be laundered just yet? You know, that shirt that you wore over an undershirt, but under your jacket, so it never even touched your skin, or the dirt of the outside world? Those jeans that you plan to wear a few more times before laundry day. Most of us don’t really need to clean clothes after each use. But we seldom take the time to put them back in the closet. And that’s when our clothes get piled on the floor. And pretty soon, they ARE dirty enough to go straight to the hamper, because we’ve been treading on them for days. It’s okay to admit it. Once we’ve isolated this problem, the solution is clear: you need a second laundry basket in everyone’s room! A basket for worn-but-not-dirty clothes. I’ve noticed it’s usually best if this basket is low and open, not a hamper. That makes it easy to find what you need. Voila! Clear floors. And bonus: less unnecessary laundry! Which saves you time, water, and electricity. What clever tricks do you have to keep your house clean… despite your children? Share below! Great post! My daughter does the sack thing with a timer for my grandkids! It’s really works with her kids, they have learned that she’s serious when the timer starts they better be picking up toys! thank you! i struggle with this with my kids. have been looking for help and/or perspective. Thanks for this suggestion – it seems like my kids can destroy a room in five minutes flat. My husband is worse than my daughter about cleaning up after himself. Thanks for these great tips. I think if you get your kids to start picking up after themselves at an early age it helps. Love the post! I only have two (and they are teenagers and should know better) and I am still having to deal with clothes, shoes, sports stuff and books all over the floor. I love the idea of the second basket in the bedroom for those clothes that are not ready to be laundered. I know that will help with the mess. Thanks! This was always, ALWAYS a challenge for me. I had baskets, one for each child, that as I moved around the house picking up their things and putting them in the appropriate basket. They were responsible for bringing those basket up to their room and putting everything that was in it away. If they walked past their basket, I emptied it and they didn’t get their things back. It’s still a struggle. I’m way past wanting my house perfectly clean and tidy (they broke me down! lol). But it’s not just the kids, its my husband too! So, I pick my fights and get over the rest. 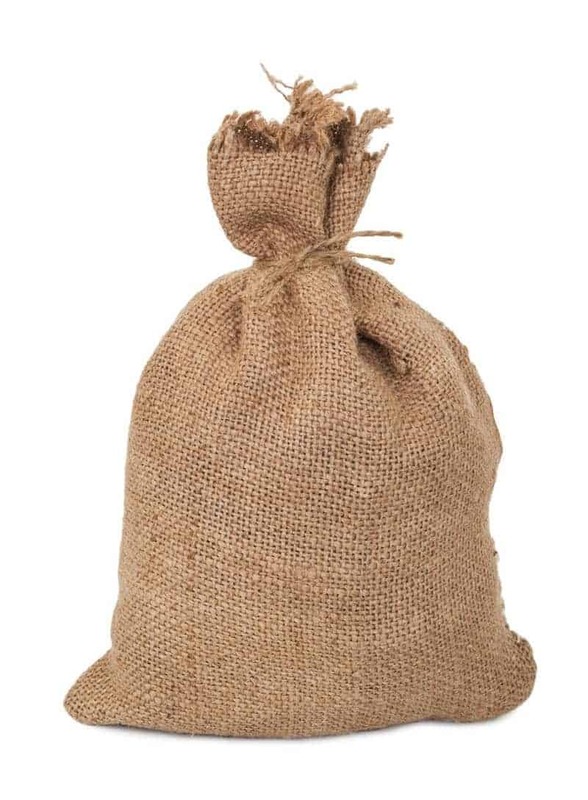 I like the gunny sack idea. This would be a good one to try out as my 2 year old continues to grow. I absolutely love the gunny sack idea. Anything in the gunny sack for 6 mos. or more gets rid of. Nice! I was taught to clean really early in life. My mom always made it fun. We would sing, we would dress up as princesses and clean, we would make cupcakes then clean and afterward have our cleaning reward. I never even knew I was doing “work”. I just thought it was fun and games. I think your gunny bag is a fantastic idea. Seems like it’ll never been clean the way i like it to be but my kids do help clean when i ask them to! I need to employ the gunnysack method. My kids go through spurts of being helpful and being extremely unhelpful. I have to second the start teaching them at a young age. Make it routine as a family.